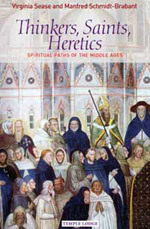 Whether souls have returned in physical incarnations as Platonists, as Aristotelians, as pupils of Chartres, as members of the Dominican Order, as Templars, as Cathars, or whether these souls accompany us as spiritual beings, a stream of spiritual continuity that begins in the Middle Ages flows through human history. Why do people today look back to the Middle Ages with such interest? Do those times have anything to do with the present? In this enlightening series of lectures, Manfred Schmidt-Brabant and Virginia Sease suggest that our sense of selfhood depends on whether we can create a true relationship to the present age. But to do this we need to understand the spiritual roots of our time. These roots, they indicate, are present in the Middle Ages. The impulses that originate from that time continue to stream into the present, helping to determine our thinking, feeling and actions. Even the biography of Europe is largely determined by what people of the Middle Ages thought, endured, believed and fought over. All of this emerges today in the consciousness of the individual and in the fabric of our communities. To aid our comprehension of this critical period, the authors embark on a broad historical survey of the culture and history - both exoteric and esoteric - of the Middle Ages. Their journey takes in King Arthur and the Celtic Mysteries; Francis of Assisi, the Franciscans and the School of Chartres; Thomas Aquinas, Averroes and the Dominicans; Cabbala and Jewish Mysticism; heretics and the Cathars; Templar secrets; spiritual Alchemy and Gothic architecture; Columbus and the Mysteries of America; and the Consciousness Soul and the historical Figure of Faust. MANFRED SCHMIDT-BRABANT was born in Berlin, Germany. He became a member of the Executive Council of the General Anthroposophical Society at the Goetheanum in 1975 and served as Chair of the Council from 1984 until his death in 2001. His service during those years included leadership of the Social Science Section of the School of Spiritual Science, and lecturing around the world on many subjects. English editions of his books include Paths of the Christian Mysteries, The New Mysteries and The Archetypal Feminine (with Virginia Sease), and The Spiritual Tasks of the Homemaker.